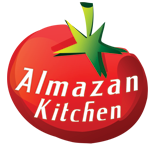 Awesome and fun to cook Indonesian dish made in the AlmazanKitchen style with fresh potato puree garnish! Great special peanut marinade & sauce with explosive-salt-gentle-sour-viscous flavors in one! Put away these everyday boring dishes, it’s time for Asian carnival! Tons of foodporn, cooking ASMR, cute cats from AlmazanKitchen Kittie Crew, your favorite “jet engine” and of course the main part of the show – food tasting! Boil the pre-salted water, cook 500g of potatoes for 40-60 min. Cut chicken breasts into small slices. Grind 1-2 garlic cloves, 25g ginger in the mortar using pestle. Add 1 tbsp. of peanut butter, mix well. Add lime juice, 1tbsp. of paprika and 1 cup of coconut milk. Mix everything well and add 1-2 tbsp. of soy sauce. Mix well again. Smash & mix 500g of cooked potatoes with salt to taste and 1tbsp. of butter. Skewer up chicken breasts, grill 5-7 minutes constantly turning. Finish off with handful of chopped fresh mint. King of Fondue – Cheese ExtremeBest BBQ Ribs Ever! – You don’t want to skip this recipe!